Technically, “hard water” is water with a high mineral content, but for practical purposes, the only mineral which really matters is lime. Lime is perfectly safe to drink, but it doesn’t necessarily taste very pleasant and the resultant lime-scale can seriously damage household appliances. The hardness of water is calculated by measuring how many milligrams of minerals are present in one litre of water. This is known as parts per million. In order to be classified as soft, water should have less than 60 ppm. After this, the mineral content in the water becomes increasingly detectable and water with 180ppm or more is classed as very hard. Over 60% of the UK has hard water with most hard-water areas being in England. The good news is that the extent of the problem has encouraged people to look for solutions or at least work-arounds. It is possible to fit water softeners directly to water outlets and in some cases, e.g. showers, this may be enough to do the job, at least with regular cleaning. In other cases, however, home owners will really only see (and taste) a difference if they use multiple levels of water softening and possibly will still need to decalcify household appliances. As kettles are such an important part of everyday life in the UK, we’d recommend investing in a good kettle for hard water areas even if you have already fitted a water softener. This will allow you to make the most of even basic brews and is arguably a must if you really enjoy hot drinks such as specialty teas and coffees. First and foremost, a good hard-water kettle has to be a good kettle. In other words, it has to be safe and comfortable to use, reasonably quiet and ideally both fast and efficient in operation. We were actually quite surprised how many anti-lime-scale kettles actually fell down on this point. They had decent filtration, but they all had weak points as basic kettles, such as difficulty seeing the water gauge. Once we had discounted these hard-water kettles, we were left with a shortlist of just five which we are happy to recommend. The hard-water kettles on our list are all electric kettles and they are all “one-temperature kettles”. Sadly we were unable to find any induction kettles or variable-temperature kettles with filtration, but we’ll keep our eyes open and if we find any, we’ll update our list. Before we give a quick explanation of the criteria we used for choosing our shortlist, we’d just like to make a point about hard-water kettles in general. Basically hard-water kettles filter water before boiling it, which means that their capacity is a combination of the filter chamber, into which you first pour the water, plus the main body of the kettle (into which the water flows once it has been filtered). This means both the anti-lime-scale kettles are a bit slower than regular kettles and that you may need to fill them up multiple times if you want to boil a lot of water. Per our previous comments, we’d also like to point out that if you live in an exceptionally hard-water area, then even a high-quality anti-lime-scale kettle may not be enough to eliminate lime-scale from your water. You may therefore want to consider filtering your water twice, e.g. once through a water softener or filter jug and then once through the kettle and/or regularly descaling your kettle. Having said all of that, here is our pick of the best anti-lime-scale kettles based on a combination of their performance as a standard kettle, their ability to filter, their general reliability and the value for money they offer. You could argue the point as to whether or not this is actually a kettle, but it heats water and dispenses it so as far as we’re concerned it qualifies as a kettle. In addition to using the very popular Brita filtering system (which deals with chlorine and metals as well as lime-scale), it has a 3 kW concealed element which can boil a single cup of water in comfortably under a minute and is very easy to clean. The overall capacity is 1.8 litres and you’ll have no problems seeing how much water is in the water tank since it is both large and clearly illuminated. The dial on top allows you to set your cup size, from 9 options. There is also a manual stop button, so you might find that the easiest approach is just to choose the largest cup and use the button to stop the water at the appropriate time. We should say up front that although this hard-water kettle looks like it is made out of stainless steel, it’s actually constructed from plastic, so if that puts you off, then you may want to head straight down to some of our other options. We’d say that if you follow the instructions and boil the kettle a few times before using the water, you should be fine. Visually, we have to say, this anti-lime-scale kettle has a very premium appearance even though its price is very budget-friendly. This hard-water kettle is far more than just a pretty face. It has a 3 kW element for brisk boil times even if you’re using it to its full 1.7 litre capacity. The lid is easily removable for filling and the water gauge is clear and straightforward to read while you’re actually filling the kettle. 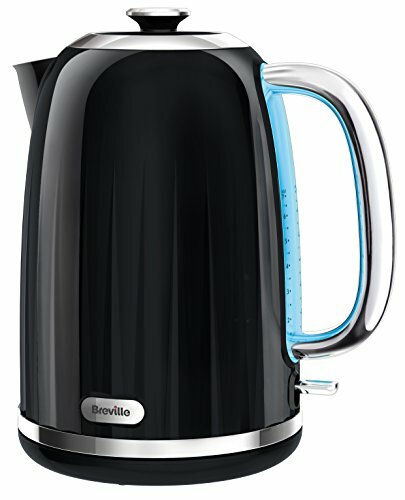 The 360° pivot base, means that both right- and left-handed users can use this anti-lime-scale kettle with equal comfort. Our only slight criticism of this hard-water kettle is that the base is a bit on the light side, so it’s easy to pick it up accidentally with the kettle, but this doesn’t strike us as a major issue. We do like the anti-slip feet which hold this kettle firmly in place and also the tidy cord storage. We’d describe this offering from Morphy Richards as being cheap and cheerful and basically a good offering if you just want an affordable way to get the job done. It may not look especially premium, but it isn’t ugly either, in fact it might fit quite well into a minimalist kitchen and it’s 1.5-litre capacity should be big enough for most households. We were actually quite impressed by the safety features. In addition to the 360° pivot base, the handle itself is actually very comfortable and the water gauge is easy to read, all the more so since it is illuminated. There’s a button to release the lid (for easy filling) and tidy cord storage. We also really liked the fact that there’s an electronic filter cartridge replacement reminder. Our one slight gripe about this hard-water kettle is that the filter chamber has quite large gaps around the edge, which means that if you fill this anti-lime-scale kettle quickly you risk the water not being filtered at all. The solution is just to make sure to fill the kettle slowly and perhaps stop a little before the top. We’re going to say up front that even though this offering from Philips is made of glass, it really isn’t the most stylish offering we’ve ever seen, however, what it lacks in looks it makes up for in quietness. This isn’t just one of the quietest hard-water kettles we’ve ever heard, it’s one of the quietest kettles we’ve ever heard. It’s also one of the most efficient. According to the manufacturer, this has a “double-action filter”. We’ve absolutely no idea how this works in practice, but we can confirm that this anti-lime-scale kettle really does seem to do a great job of filtering the water. Even though this hard-water kettle only has a 2.2 Kw element, it’s a flat, stainless-steel one which helps it to work very efficiently and in all honesty think very few people are going to notice the difference in speed compared to the higher-powered kettles. The flat element does, however, make this hard-water kettle very easy to clean. Similarly, we think the 1.5-litre capacity will be fine for most households, on that note, even though the printing is in white; the water indicator is nicely legible against the glass body. As you would expect from an anti-lime-scale kettle of this quality, there is a 360° pivot base plus a cord-winder. A light indicates when the kettle is switch on and there is boil-dry protection. The hinged lid has a release button for both filling and cleaning. It also reduces the likelihood that your hand will come into contact with steam. This offering from Russell Hobbs is another glass hard-water kettle and in our opinion looks rather stylish, especially when it’s in use and is illuminated in blue. In practical terms, it has a 1.5-litre capacity and a 3 Kw element so you can boil a decent amount of water in a fairly brisk time. 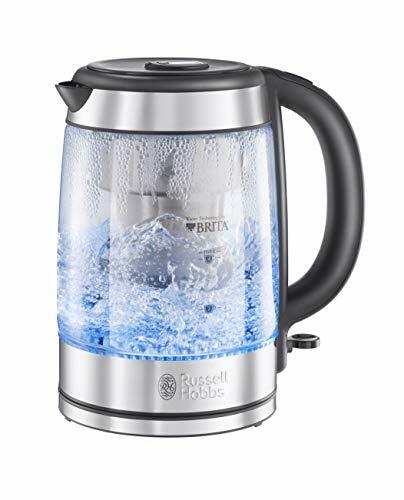 In addition to the 360° base and cord storage, this anti-lime-scale kettle from Russell Hobbs has a “perfect pour” spout, which does seem to do a very good job of getting the water when you want it to be without splashing. There’s also an easy-release lid and a cartridge-replacement reminder, plus the water gauge is easy to read even while the kettle is being filled. 1.5 Litre high-quality glass kettle with BRITA filtration. 1 litre boil capacity ,0.5 litre hopper capacity. As always, the best kettle for hard water is the one which works best for you. 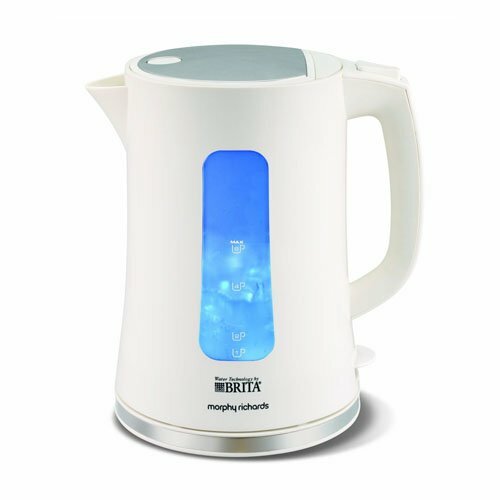 All of the hard-water kettles we have listed do a perfectly good job of filtering water, therefore the main point is to choose an anti-lime-scale kettle which suits your lifestyle. 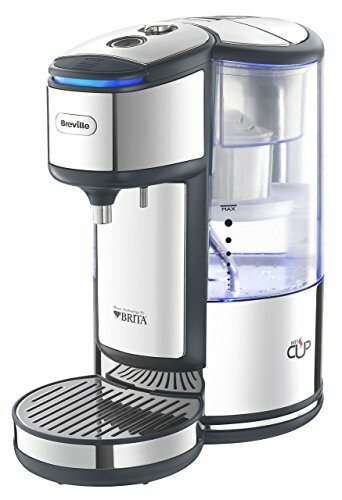 If safety is your main consideration, then the Breville HotCup Water Dispenser may be the best option as it stays in one place and therefore eliminates the possibility of accidents caused by improper holding (or just weaker hands). If you are just looking for a basic hard-water kettle to get the job done then the alternative option from Breville or the Morphy Richards anti-limescale kettles are both affordable and effective. 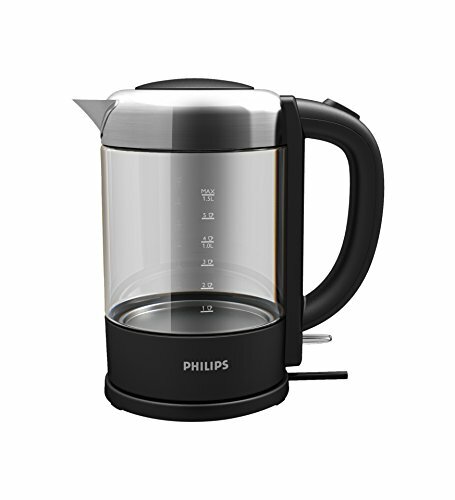 If you’re looking for a premium hard-water kettle, then either the Philips or the Russell Hobbs would fit the bill nicely.